Standing on the north-eastern side of Germany and close to Poland, Berlin is well-placed for day trips and is relatively close to some exceptional German attractions. If you can bear to tear yourself away from all that Berlin has to offer, then do consider taking an excursion to the medieval town of Bernau, to the northerly Müritz lake region, or to Potsdam - capital of Brandenburg (the surrounding German federal state). If you have plenty of time to go exploring in this region of Germany, then do consider investigating the attractions to be found within Dresden, Hanover and Leipzig. Although the Isle of Usedom may well lie 250 km / 155 miles to the north of Berlin, day trips are actually possible by train. Usedom's beautiful stretch of Baltic coastline is definitely a tonic if you are looking to escape Berlin's frenetic city life. If you hanker after a taste of Polish life and attractions, then jump on a train and head for Poznan (Posen) or Szczecin (Stettin), or to the city of Frankfurt an der Oder, which borders Poland and is not to be confused with Frankfurt am Main. The medium-sized town of Bernau stands at 20 km / 12 miles north-east of Berlin and is home to an impressive series of medieval remains, dating as far back as the 14th century. In particular, look out for the ancient city wall, the late Gothic church of St. Marien and the Museum of Local History, which is spread between two different locations, including the town gate. Day trippers in a hurry should consider catching the S-Bahn S2 train from the Friedrichstrasse railway station. As the capital of Germany's Saxony region, Dresden is a large and interesting city, with undeniable tourist appeal. Dresden is located some 194 km / 121 miles south of Berlin and next to the River Elbe, where it is overflowing with Baroque architecture and has a charming historic district (the Altstadt). Dresden's leading attractions include the Burg Stolpen Fortress, the Church of Our Lady (Frauenkirche), the Dresden Royal Palace (Residenzschloss), the Pillnitz Castle (Schloss Pillnitz), the Zwinger Palace, and also the City Museum (Stadtmuseum), which recalls how the city rebuilt itself following bombing in the Second World War. Although at 291 km / 181 miles from of Berlin, Hanover (Hannover) is really too far for a relaxing day trip, it is well worth visiting if you are headed west. Hanover is a medieval German city with plenty of history for sightseers to enjoy, with walking tours of the Old Town providing an excellent way to familiarise yourself with its oldest attractions. However, Hanover is also very family orientated with its Grossaquarium (Big Aquarium) and city zoo drawing crowds in the summer season, while the Hanover Fairground and its innumerable trade fairs is another magnetic force for the city. 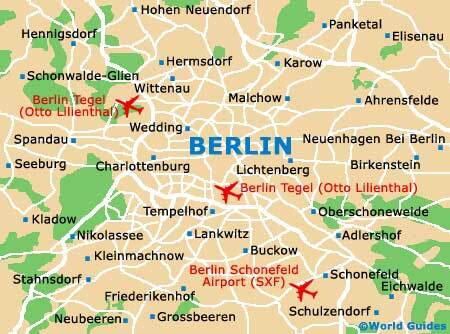 Leipzig is a dynamic and energetic city and is situated approximately 195 km / 121 miles south-east of Berlin. With medieval fortifications and family attractions a plenty, it is easy to understand why Leipzig enjoys such high visitor numbers. Leipzig Zoo (Zoologischer Garten), the city's Opera House (Opernhaus), the Market Square (Markt), the Museum of Local History (Stadtgeschichtliches Museum) and the Leipzig Museum of Fine Arts (Museum der Bildenden Künste) are all particular tourism highlights. If you head around 155 km / 96 miles west of Berlin, you will come upon Magdeburg, the capital of Germany's Bundesland of Saxony-Anhalt region. A good way to sightsee in the green city of Magdeburg is to take a leisurely cruise along the River Elbe, and there are a number of different cruise packages available to visiting tourists. The Gothic architecture of the Cathedral of St. Maurice and St. Catherine, the Elbauenpark (Millennium Tower) and the Magdeburg Museum of Cultural History (Kulturhistorisches Museum) all also deserve a strong mention. Potsdam is a mere 40 km / 25 miles south-west of Berlin and stands alongside the River Havel. There are many great places to visit within the Potsdam area. Located within Potsdam's suburb of Babelsberg is a historic German film studio and theme park, while to the west of the city centre, Sanssouci Park is another much-visited attraction. Of note within the Sanssouci Park is the 18th-century New Palace (Neues Palais), the Renaissance-style Orangery (Orangerieschloss) and the Charlottenhof Castle (Schloss Charlottenhof). Situated just under 50 km / 31 miles to the north of Berlin, Sachsenhausen is home to a very poignant and thought provoking attraction - the Sachsenhausen Concentration Camp. During WWII, more than 200,000 men passed through the gates of the Sachsenhausen Concentration Camp, with around 100,000 of its resident 'slaves' being murdered here and incinerated in giant ovens. If this horrific insight into the past is a little too much, then head nearby to Oranienburg and its charming palace. Usedom has become something of a summer seaside resort, with a lengthy stretch of sandy beach measuring in excess of 40 km / 25 miles and featuring a popular area for nudists. Something with a difference is Usedom's Peenemünde attraction, where one of the world's very first rockets was launched in 1942.